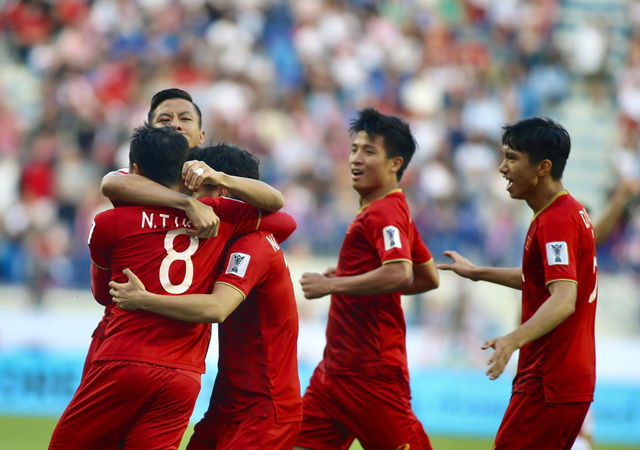 DUBAI, Jan 20 - Vietnam’s young guns guaranteed another night of frenzied celebrations back home when they beat Jordan 4-2 on penalties to reach the quarter-finals of the Asian Cup after extra time had failed to break a 1-1 deadlock on Sunday. It was a first knockout victory at the continental championship for Vietnam and set up a meeting with Japan or Saudi Arabia, both former champions, at the same stadium on Thursday. The match had finished all square after Jordan’s Baha Abdelrahman scored from an indirect free kick in the first half and Nguyen Cong Phuong equalised with a volley six minutes after the break. Vietnam’s Russian-born goalkeeper Dang Van Lam was the hero of the shootout after he dived low to his right to save Ahmad Saleh’s effort, allowing Bui Tien Dung to coolly convert his spot kick for the victory. “We got through to the round of 16 by the narrowest of margins so I really appreciate the players, they really did their best today,” Vietnam coach Park Hang-seo said. While the youthful Vietnam team had squeaked through to the last 16 by virtue of having a superior disciplinary record to Lebanon, Jordan had beaten reigning champions Australia and Syria to win their group. The confident Jordanians started stronger and looked like they might outmuscle the Vietnamese, going ahead in the 39th minute from an indirect free kick awarded inside the box for a high boot. Vietnam had some grounds for grievance, first in that the free kick was awarded at all and secondly over whether Yousef Al-Rawashdeh actually moved the ball to tee up Abdelrahman. There could be no complaints about the midfielder’s strike, though, as he celebrated his 120th cap by crashing the ball into the roof of the net from the left-hand edge of the area. Going behind galvanised Vietnam and they peppered Amer Shafi’s goal before the break, the Jordan goalkeeper doing particularly well to tip Do Hung Dung’s drive over the bar. The Southeast Asian champions poured forward in search of a winner but for all their possession, neat interplay and stylish touches, they could not quite carve out a goal even as the Jordanian threat receded. “It’s always difficult when you lose,” said Jordan’s coach Vital Borkelmans.